The previous post (here) covered common Hebrew language tools; this one does the same for Greek tools. Although the principles are essentially the same for both groups, one will notice that fewer standard Greek works are cited by abbreviation. In spite of this, one should refer to section numbers whenever possible, to ensure the most precise reference. As with the earlier posts, we begin with principles for referencing these language tools in a traditional (i.e., footnote; not author-date) citation system, then offer examples of those principles for the most widely used works; abbreviations for all the tools mentioned in the post appear at the end. 1. Citations of these works should be placed within footnotes, not embedded within the main text. 2. Use the § symbol to indicate that you are citing a section, not a page. When referencing multiple sections, use §§. Notice the difference between citing multiple sections (example 2) and multiple parts of the same section (example 3; only one §). Note especially that no punctuation separates the abbreviation and section marker and that the usual rules for inclusive numbers applies to the listing of section ranges (SBLHS §4.2.4). 3. Works cited by abbreviation are referenced the same in subsequent citations; there is no shortened form. Language tools cited in full (see, e.g., Moulton below) follow the usual short-title reference style. 4. Works cited by abbreviation should not be included in a bibliography; list them only in an abbreviation list. 5. When they are frequently cited, works without an SBLHS abbreviation (e.g., Zerwick, Robertson) may also be referenced by abbreviation. In such cases these works are listed only in an abbreviation list, not in the bibliography. The examples below apply these principles to the most commonly cited Greek language tools. Readers with questions about works not covered are encouraged to email us at sblhs2@sbl-site.org. BDF: The abbreviation refers to the names of the three principal scholars involved in the creation of the work: original author Friedrich Blass, reviser of multiple German editions Albert Debrunner, and translator and editor Robert W. Funk. Citations to BDF are by section, with subsections noted when necessary (example 2). Subsection references are frequently given in two places, with an explanation at the beginning of the entry and one or more examples later in the entry. Burton: This work is usually referenced by author, title, and publication information but may be cited by author last name as an abbreviation. 17. Ernest DeWitt Burton, Syntax of the Moods and Tenses in New Testament Greek, 5th ed. (Chicago: University of Chicago Press, 1903), §§89–94. Dana-Mantey: There is no standard abbreviation for this work, so it should be cited with full publication information in a footnote (author, title, publishing details), by section, not by page. 63. H. E. Dana and Julius R. Mantey, A Manual Grammar of the Greek New Testament (New York: Macmillan, 1927), §155. Funk: This work is usually referenced by author, title, and publication information but may be cited by author last name as an abbreviation. In either case, section(s) should be cited, not page(s). 16. Robert W. Funk, A Beginning-Intermediate Grammar of Hellenistic Greek, 3rd ed. (Salem, OR: Polebridge, 2013), §431. Goodwin: This work is usually referenced by author, title, and publication information. Cite by section number, not page. 83. William W. Goodwin, Greek Grammar, rev. Charles Burton Gulick (Boston: Ginn, 1930), §718. Moulton: The complex publishing history of this four-volume work deserves mention. James Hope Moulton published three editions of volume 1 and had written most of the second volume before his 1917 death at sea, the victim of a submarine attack. His student W. F. Howard completed writing and edited volume 2, after which there was a lapse of more than three decades until the publication of volumes 3 and 4, authored by Nigel Turner. The entire work is still cited as Moulton’s, although individual volumes should be attributed to their actual authors, as below. None of the volumes offers a clear set of section labels, so citations are by page. 22. James Hope Moulton, Prolegomena, 3rd ed., vol. 1 of A Grammar of New Testament Greek, 4 vols. (Edinburgh: T&T Clark, 1908–1976), 108–10. 5. James Hope Moulton and W. F. Howard, Accidence and Word Formation: With an Appendix on Semitisms in the New Testament, vol. 2 of A Grammar of New Testament Greek, by James Hope Moulton, 4 vols. (Edinburgh: T&T Clark, 1908–1976), 178. 56. Nigel Turner, Style, vol. 4 of A Grammar of New Testament Greek, by James Hope Moulton, 4 vols. (Edinburgh: T&T Clark, 1908–1976), 71. Robertson: This older work is usually referenced via full citation, but frequent reference to the work justifies citing it by abbreviation, in which case we recommend using the author’s last name. Citations to specific pages are generally the simplest, although one may cite a specific subsection as shown in example 2. 33. A. T. Robertson, A Grammar of the Greek New Testament in the Light of Historical Research, 4th ed. (London: Hodder & Stoughton, 1923), 523. Smyth: Although this standard work is not listed in SBLHS, we recommend referencing it by the author’s last name. Smyth is cited by section and, when necessary, subsection. Zerwick: This work is generally cited with full publication information (author, title, publishing details). Frequent reference to the work justifies citing it by abbreviation, in which case we recommend using the author’s last name. Cite it by paragraph number; note that the section numbers in the margin are references to the third Latin edition and should not be used for citations to the English edition. Blass, Friedrich, Albert Debrunner, and Robert W. Funk. A Greek Grammar of the New Testament and Other Early Christian Literature. Chicago: University of Chicago Press, 1961. Burton, Ernest DeWitt. Syntax of the Moods and Tenses in New Testament Greek. 5th ed. Chicago: University of Chicago Press, 1903. * This work is in the public domain and available online here. Dana, H. E., and Julius R. Mantey. 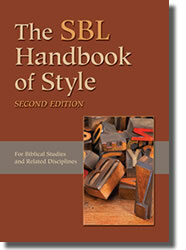 A Manual Grammar of the Greek New Testament. New York: Macmillan, 1927. Funk, Robert W. A Beginning-Intermediate Grammar of Hellenistic Greek. 3rd ed. Salem, OR: Polebridge, 2013. Goodwin, William W. Greek Grammar. Revised by Charles Burton Gulick. Boston: Ginn, 1930. Moulton, James Hope, with W. F. Howard and Nigel Turner. A Grammar of New Testament Greek. 4 vols. Edinburgh: T&T Clark, 1908–1976. Robertson, A. T. A Grammar of the Greek New Testament in the Light of Historical Research. 4th ed. London: Hodder & Stoughton, 1923. * The third edition of Robertson is available online here. Smyth, Herbert Weir. Greek Grammar. Revised by Gordon M. Messing. Cambridge: Harvard University Press, 1956. Zerwick, Maximilian. Biblical Greek Illustrated by Examples. Translation of the 4th Latin edition by Joseph Smith. Scripta Pontificii Instituti Biblici 114. Rome: Editrice Pontificio Istituto biblico, 1963. Repr., SubBi 41. Rome: Gregorian & Biblical Press, 2011.